Country sampling frame maps show the landscapes and e-plots where data is being collected within a given country. Approximately six landscapes, 10 by 10 km in size, are placed throughout a country based on vegetation and climatic conditions. 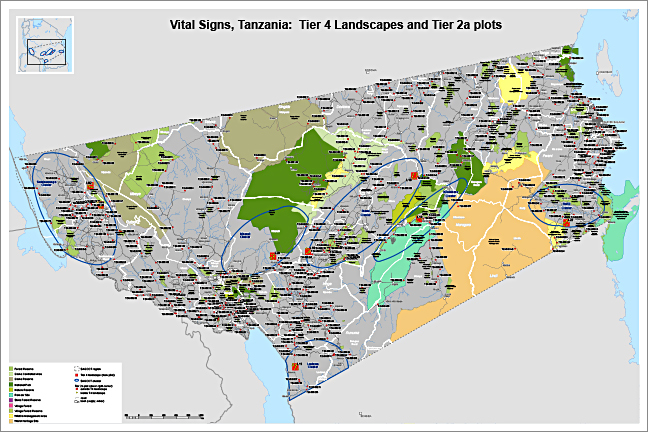 Other factors considered for landscape placement include areas with intensive land use patterns or areas targeted for national large-scale land use investments, such as agricultural intensification. The e-plots are one-hectare plots, randomly placed throughout the country to measure spatial and temporal dynamics of agriculture and ecosystems. Vital Signs works closely with country partners and stakeholders to determine final sampling frame placement.